Joshua James (1826-1902) served as a lifesaver for 60 of his 75 years. Born in Hull, Massachusetts, he joined the Massachusetts Humane Society (an organization modeled on the Royal National Lifeboat Institution – RNLI) at age 15 after his mother and one of his sisters died in a ship wreck. While serving as a volunteer lifeboatman at the MHS station in Hull, he pursued his occupation as shipowner, mariner, and fisherman. He participated in numerous rescues with the MHS and was awarded a bronze medal in 1850. In 1876, James was appointed keeper of four MHS life-boats at Stony Beach, Point Allerton, and Nantasket Beach. 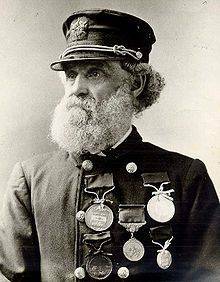 In 1886, a special silver medal was struck for him in recognition of his “brave and faithful service of more than 40 years” during which time “he assisted in saving over 100 lives”. 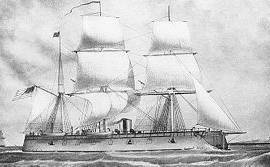 During the storm of 25-26 November 1888, he and his crew saved the lives of 29 persons from five vessels. For this tremendous 36-hour rescue effort, he received both the MHS gold medal and the Gold Life-Saving Medal from the US Government. In 1889, the US Life-Saving Service established a Life Saving Station at Point Allerton. Waiving the rules on age, the US LSS appointed Joshua James as the station’s first keeper, even though he was over 62 years old. He passed the physical examinations both that year and in 1900. During the thirteen years that he was keeper at the station, he and his crew saved 540 lives and rescued ships and cargo valued in excess of one million dollars. On the morning of March 19, 1902, with a northeast gale blowing, he took his boat and crew out for an hour of training. Upon grounding the boat at the end of the training session, he sprang onto the beach, glanced at the sea, and stated: “The tide is ebbing.” He dropped to the sand, dead of a heart attack. He was buried in his hometown of Hull with a lifeboat for a coffin. The Superintendent of US Life-Saving Service, Sumner Kimball, attended and spoke at his funeral.